COLUMBIA — The majority owner of two canceled nuclear reactors in South Carolina is already moving to charge its electric customers for the project’s failure. SCANA Chief Executive Kevin Marsh told state utility regulators Tuesday they are prepared to charge customers more than $2 billion over the next 60 years for the abandoned reactors which were supposed to usher in a new age of nuclear power in the United States. The briefing by SCANA executives in front of the S.C. Public Service Commission comes less than a day after its partnering utility, state-run Santee Cooper, announced that a decade of work and around $9 billion in steel, concrete and labor already sunk into the plant is likely wasted. The abrupt news of the reactors being cancelled prompted state lawmakers to announce the creation of a new legislative caucus, which will be tasked with reforming the state’s utility regulations and ensuring that another power project doesn’t waste billions of dollars in the future. Their first meeting is scheduled for Wednesday. “The only responsible thing to do is understand how we got here and make sure we never get here again,” said James Smith, D-Columbia, who is helping to organize the bipartisan group of lawmakers. State Sen. Mike Fanning, a Democrat from Fairfield County — where the plant is and where workers were sent home — had a different take. The first-term lawmaker suggested the state should provide financial assistance to finish the reactors. Estimates suggest that completing the project could cost another $10 billion, at least. The state bailing out the projects is very unlikely — the total state budget this year is $8 billion — and state lawmakers worry each year over how much to spend on fixing roads or schools. SCANA’s executives told state regulators they had met with U.S. Department of Energy Secretary Rick Perry and others seeking a federal bailout so they could continue construction, but no federal officials were willing to agree to hand over billions of dollars. The reactors were expected to be the gems of SCANA’s corporate portfolio, but the incomplete power stations could now become expensive holes in the ground that customers with its subsidiary, SCE&G, may have to pay for. Marsh and other SCANA executives said they could also seek to build some other type of power source, namely natural gas-burning turbines, that customers would have to cover too. 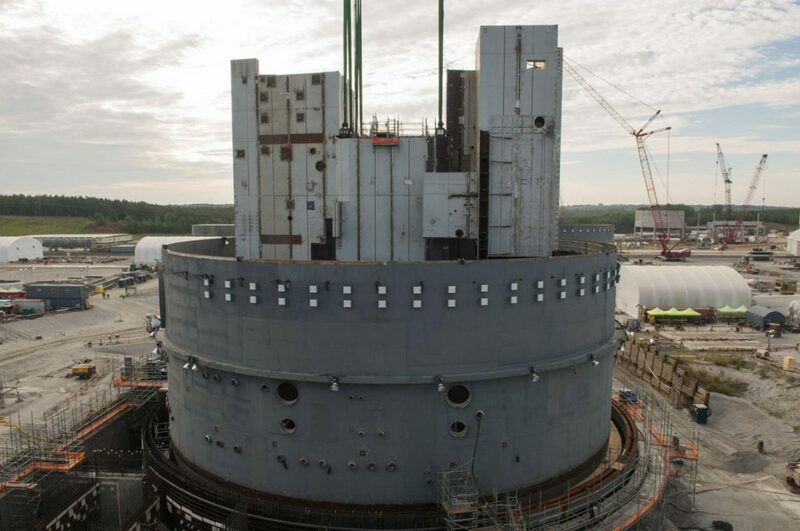 SCANA’s executives reiterated Tuesday they had considered completing one of the reactors but that the effort was undermined by Santee Cooper’s decision that completing the reactors was not in the best interest of its customers. SCANA owned 55 percent of the work at the V.C. Summer project, while Santee Cooper shouldered 45 percent. What had started out as a $10 billion effort has skyrocketed in price in recent years due to construction issues and scheduling delays. The price tag to complete the reactors now stands at more than $20 billion, according to utility presentations. For the past nine years the construction of the two nuclear reactors was a cash machine for SCE&G. With the help of a 2007 state law that was rushed through the state Legislature, the investor-owned utility was able to charge customers while the reactors were being built and marked up a 10 percent profit for their shareholders on every dollar they collected. SCE&G collected nearly $2 billion to this point, which has buoyed their earnings for investors even when other parts of the company’s electric and gas businesses weren’t as profitable as they would have liked. If SCE&G officials convince state regulators of their plans, the customers’ contributions to the shuttered reactors won’t end there. The same 2007 law that prompted the proposal to build the reactors could also give SCE&G the ability to charge customers for all of the other money spent at the soon-to-be abandoned site. They estimate that remaining cost to be around $2.2 billion, after a bankruptcy settlement with the main contractor and taxes are deducted. That reality caused SCANA’s stock prices to increase for a second straight day Tuesday, even as the utility was announcing the demise of one of the biggest investments in its corporate history. SCANA’s share price have risen by 10 percent since pulling the plug on the project around noon Monday. Critics of SCE&G point out that under the utility’s plan customers will be paying for reactors that likely won’t produce a single kilowatt of electricity six decades from now. Therein lies the next regulatory and legal battle. Environmental groups, such as the Sierra Club, are seeking to challenge the for-profit utility’s ability to charge those abandonment costs to customers’ monthly electric bills. Bob Guild, an attorney for the group, is hoping to find evidence that will prove SCE&G’s decision to proceed with the reactors was unjustified by the economic circumstances at the time — something that could invalidate the company’s claims under state law. The Columbia attorney has been one of the few people who have resisted SCE&G’s nuclear expansion plans since the beginning. When the state’s utility regulatory agency approved SCE&G’s construction plans in 2008, Guild challenged the proposal taking a case all the way to the S.C. Supreme Court. He ultimately lost. Guild and other environmental groups have been in support of canceling the nuclear reactor construction, because of the escalating costs. But they disagee with SCE&G officials about what should come next. They’re not only seeking to challenge the company’s ability to recoup the costs of the reactors from customers but also plan to challenge any plans by SCE&G to build other power plants in place of the abandoned nuclear reactors. The groups instead want the state agency charged with regulating for-profit utilities to require SCE&G to reduce the power needs of its customers by advancing energy-efficiency efforts in homes and businesses and use alternative energy sources, such as solar.